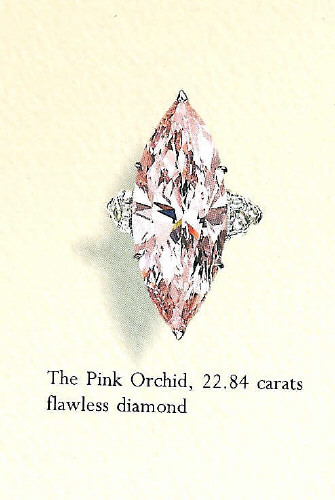 This purplish-pink marquise cut diamond weighs 22.84 carats and is known as the Pink Orchid. Graff Diamonds of London owns the stone. I wish they would go into more detail on their site about their unusual gems, if they did, I would post it here. Pink diamonds, especially ones of this size, are extremely rare. This diamond is most likely a naturally colored one, as well. Robert Mouawad, a collector of large and unusual diamonds has a 21.06-carat pink diamond known as the Mouawad Pink, which he values at $12 million, and a purplish-pink diamond weighing 24.44 carats called the Mouawad Lilac, valued at $20 million. So you can imagine the Pink Orchid would be at least $12 million.